Mo Willems’ latest pigeon adventure came out earlier this month, and it was officially the first book I ever read aloud to H. It seemed fitting to start with the Pigeon since I’m a big fan of these books, and they also kicked off my collection of signed books for H’s library. I have to admit I wasn’t blown away during the first reading of this story, which features the Duckling from The Pigeon Finds a Hot Dog. 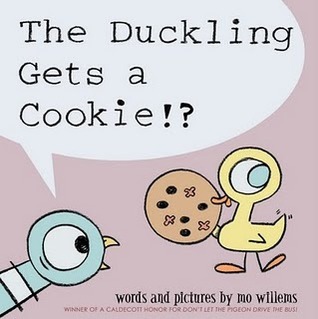 The Duckling politely asks for a cookie and is rewarded with a nut-filled cookie apparating from out of nowhere. This sends the Pigeon overboard, since he does not understand the difference between constantly asking for things and asking nicely for things. But then the Duckling makes a generous gesture that warms the Pigeon’s heart–but the Duckling has its own reasons for being so generous. My first impression was that this was a fine addition to the Pigeon series but nothing spectacular. Especially after a 4 year wait for a new story following The Pigeon Wants a Puppy. Frankly, the Pigeon’s whining and lack of self awareness here grated on me. But the more I read this one the more charmed I became. Maybe having a squirming infant in my arms while trying to read this book didn’t help my perspective the first time around…she was not appreciating her mother’s theatrical vocal work that day. I also think it’s just impossible to recapture the strange, wonderful magic of Don’t Let the Pigeon Drive the Bus!, which still has the most astonishing effect on children of any story I’ve ever read aloud. But kids can’t get enough of this bird, and I’m happy to see he hasn’t retired before my daughter can experience his newest adventure.